Did you know? October is National Cyber Security Awareness Month. During October, Stay Safe Online is encouraging everybody to raise awareness about safety and security while browsing the internet. However much you use the Internet, cyber security is something every single individual and organization should consider. With a growing number of online fraud, thefts and abuse, no one is 100% secure. This means that our finances, identities, privacy and economies are threatened on a daily basis by criminals looking to benefit from lack of protection. But it doesn’t have to be this way. This blog post—which we hope you find informative and useful—is our own effort to help raise awareness about the importance Cyber Security. “Cyber security” refers to the systems and processes that guard computers and technology from unauthorized access, change, or destruction. Cyber security is a critical issue for all consumers, businesses, and organizations. As more and more devices get connected to the Internet, and as more critical infrastructure relies on a safe Internet, cyber security is becoming an increasingly important and spoken-about topic. Cyber security is important and increasingly risky because businesses, organizations, and governments collect and process vast amounts of personal data and confidential information from consumers. As this data is transferred over the web, it is of utmost importance that systems are in place to guard against cyber attacks. What events are going on during National Cyber Security Awareness Month? This year’s NCSAM has been broken down into weekly themes. Here is an abbreviated timetable. For more information, please visit http://www.staysafeonline.org/ncsam/about. Week 1 (Oct 1–3): STOP. THINK. CONNECT. Week 1 emphasizes simple measures people can take to be safer and more secure when browsing online. The STOP.THINK.CONNECT campaign kicks off with by raising awareness for online safety. How can software engineers build security into information technology products? During this week NCSAM aims to increase awareness about what consumers should look for in products as well as explaining the best tools and software to use to improve your cyber security. Many individuals use iPads, personal computers, mobile phones, and so on on a daily basis. But using these in an unsafe manner can give away a lot of personal data. Know what to do to protect your devices. The Internet of Things—the ability of objects and devices to transfer data—is profoundly changing the way that technology is used. Much of the critical infrastructure powering the the world today relies on the Internet of Things. How do we protect the security of critical infrastructure? People understand the power of the Internet, but not many people forget the fragile physical infrastructure it relies on, as they believe that the Internet is a transparent and invisible cloud infrastructure. How can entrepreneurs and businesses of different sizes protect the cybersecurity of their organizations, customers, and employees? This week, NCSAM highlights the importance of cyber security for small business. For far too long, SMEs have suffered at the hands of online criminals who attack SMEs that don’t invest in protecting their online infrastructure. In this week, the NCSAM teaches SMEs how to effectively protect critical material from prying eyes. NCSAM will educate law enforcement officers in how to help communities fight cybercrime, and educate their communities with ways to guard against identity theft, fraud, phishing, and other online crimes. For full details, please visit http://www.staysafeonline.org/ncsam/about. Running the most recent versions of your operating system, virus scanners, apps, and browsers is the #1 defense against online threats. We know it can be annoying to get a pop-up prompting you to update while you’re typing emails or doing your work, but don’t be too quick to dismiss update reminders. Turn on automated software updates so your apps can stay up to date against security vulnerabilities and viruses. Tip #2: Don’t lose your device! You could load your computer or smartphone with all kinds of security software and vigilantly keep it up to date with the latest software… but if you ever lose the device itself, your emails, photos, and personal data are up for grabs! Be vigilant about your hardware. Use a brightly colored smartphone or tablet case to make your device easier to keep track of. It’s also imperative that you back up your data regularly and activate any device locator apps. Many manufacturers now provide device location services with new devices, or you can download a third-party anti-theft app. We’re fans of 1Password, KeePass, and LastPass—password managers that help you generate gibberish strings of alphanumeric characters as passwords. Use passwords that even YOU don’t remember. And don’t use the same password for every service! Imagine if one of your services (for example, Facebook) got hacked, and the hackers had access to your email address and password. If you use the same password for every service, then that hacker could easily hack into your other accounts using the same email and password combination. Many services now provide 2-step verification, including Google and Dropbox. If you have the option to use 2-step verification, by all means use it. With everybody’s profiles online now, and with people oversharing personal information in blogs and social media, it’s actually easy to find the answers of people’s security questions with a quick Google search. Check out this article in the Washington Post about how a reporter was able to hack into her brother’s iCloud account in three minutes with information about him that was easily guessable or readily available on the Web. Instead of answering security questions with obvious answers, we suggest answering with undecipherable passwords (saved, of course, in your password manager from Tip #3). It’s cool to be able to share what you’re eating and where, or if you’re on vacation somewhere on social media. But for criminals, knowledge is power. Don’t let criminals befriend you and gain access to information like what school you go to, what company you work at, where you live, and where and when you vacation. Tip #7: When in doubt, throw it out! If you ever receive suspicious links or .exe files in your email, DON’T OPEN THEM! Many email providers now have built-in virus scanners to help make sure that any emails you receive aren’t infected with malware, but you can never be too sure. If there is any doubt in your mind about a link or file’s safety, DON’T OPEN IT. Further to the previous point about not clicking on suspicious links—hardware can also be infected with malware! Malware can be spread through infected flash drives, external hard drives, and even smartphones. Make sure that you’re plugging in external hardware from trusted sources. Sites with http:// are NOT secure. If you ever need to provide personal data or passwords, make sure the site you’re using has https://, which means that the website has taken measures to secure your connection by encrypting your session. Free Wi-Fi seems to be everywhere now… and unprotected free Wi-Fi provides fertile ground for hackers and bad guys to intercept your data. Don’t use unprotected free Wi-Fi without a VPN. If you don’t have a VPN, then never sign into anything requiring a password via unprotected free Wi-Fi. Also, make sure that you turn off file sharing on your computer so that people on your shared network can’t snoop your files. That’s it for our tips. We challenge you to take action on at least three of these tips today! Join us! Participate in #NCSAM yourself. If you’re concerned about cyber security, whether it be for yourself, your children, or your company, there are always ways in which you can participate and spread the message in October. You can post cyber security and online safety messages and reminders about the National Cyber Security Awareness Month for your friends and family to see. In addition to this, you can like their official Facebook page, or follow their Twitter account. Sharing on social media is an excellent way to help promote cyber security, and it is encouraged to support awareness. Once you have liked their page, feel free to like our ExpressVPN page or follow us on Twitter. We will be posting content on cyber security in the coming month. A reminder: when you are posting on Facebook or Twitter, use the official NCSAM hashtag #ncsam to give your message a further reach. You can also download the NCSAM logo here to use as your Facebook profile image as well. Send emails to friends and family letting them know about the importance of cyber security. Offline, you can print this page and stick it to your fridge, or pin it on your wall to remind everyone to stay safe online and to read more about how to improve their online security. You can discuss methods of staying safe online with your children over dinner time, in order for them to truly understand how to stay safe. Also, you can download the NCSAM poster and display it at your school or office place to encourage your colleagues to read more about cyber security. 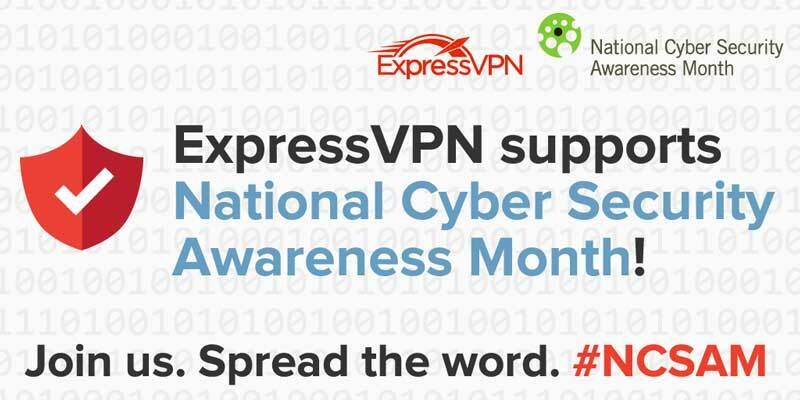 There are many companies and organizations who are actively taking part, and ExpressVPN is proud to be able to help educate people online—not just during this month, but year round. ExpressVPN agrees with the National Cyber Security Alliance that Internet security should not be just about reactively stopping online criminals, but rather it should be about proactively creating an understanding of why Internet security is such an important foundation of the Internet. We use the Internet to do all kinds of marvelous things: keep in touch with loved ones, run our businesses, handle transactions, build communities. Let’s do our part to make it a safe and secure space for everybody!